With the Northern Ireland backstop continuing to be a thorn in Theresa May’s side, all eyes and ears were on Taoiseach (Irish prime minister) Leo Varadkar when he appeared in Davos on Thursday. Sitting down with Euronews’ Shona Murray, he said a "no deal" Brexit would not rule out the need for common rules on customs and market regulations. “And that is in direct conflict with the view that the United Kingdom can go it alone entirely on these issues," he said. He also addressed concerns about the Good Friday Agreement and the spectre of future sectarian violence. While careful not to conflate recent incidents, including a car bomb in Londonderry/Derry, with the current Brexit deadlock, he said the Brexit process was now part of the context of preserving peace on the island of Ireland. 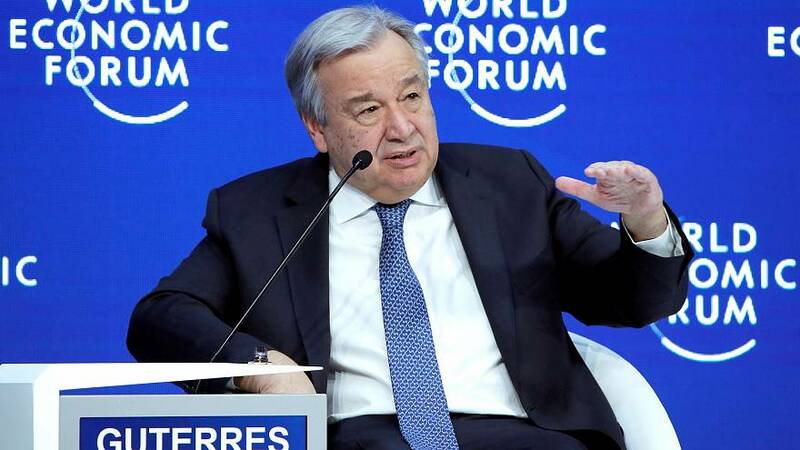 In one of the key addresses of the day at Davos’ Congress Centre, UN Secretary-General Antonio Guterres attempted to strike an optimistic tone for the future. Adding to a common thread throughout the summit, Guterres affirmed his belief in multilateralism as a way of solving the problems threatening the world. Reports of the centre left’s death greatly exaggerated? President and CEO of the International Rescue Committee (IRC) and a former UK Foreign Minister David Miliband sat down with Andrew Neil for Euronews on Thursday morning. Veteran broadcaster Neil put the question to the former Labour politician that Jeremy Corbyn had succeeded where other socialist and social democratic parties in Europe had failed by moving more to the left. “I think it is striking… that, despite the fact that we have a government that, in all sorts of ways – Brexit but also elsewhere – is going nowhere and leading the country nowhere, Labour is still struggling to assert itself,” Miliband replied. In response to questions about populism and Brexit, Miliband told Neil that he represented an area that had experienced relatively high economic growth and high employment rates during the last Labour government but voted for Brexit out of concern for their children’s jobs and futures. After travelling 32 hours by train from Stockholm and sleeping out in sub-zero temperatures in a tent, 16-year-old climate activist Greta Thunberg has already made her mark on Davos. The teenager took the world by storm after her UN speech about climate change went viral, and served as the impetus behind an ever-growing global movement of school strikes for the environment. In what appeared to be the burning issue of the day, Brexit was again firmly in the spotlight with the arrival of yet more UK Cabinet ministers in the Swiss Alpine resort. Chancellor of the Exchequer Philip Hammond was perhaps the most eagerly-watched. He was due to speak on a morning panel about Europe alongside Dutch PM Mark Rutte, Irish premier Leo Varadkar and EU finance commissioner Cecilia Malmstrom amongst others, but he pulled out, attending breakfast and lunch meetings with business leaders instead. Talking at the CBI’s annual Davos lunch, he strongly opposed the idea of a second EU referendum, calling it “a Pyrrhic victory to meet the needs of the economy” if the vote was re-run. Lithuanian President Dalia Grybauskaitė went even further, saying a "no deal" Brexit would be better than the “chaos” of extending negotiations. "Nobody cares anymore what exactly [the] details are," she told Euronews' political editor Darren McCaffrey. Is there a better way of managing migration? Exacerbated by growing inequality, conflicts and the effects of climate change, migration has long been a thorny issue, particularly in Europe since the 2015 crisis. Politicians and business leaders came together at a panel discussion, moderated by Euronews’ correspondent Isabelle Kumar, to grasp the nettle and discuss better ways of managing migration flows that affect 260 million people. Many of the participants agreed that business had an integral role in alleviating the causes, integrating migrants and providing economic opportunities. Moldova's foreign minister Tudor Ulianovschi said: “We need to work in a more organised holistic fashion with the business sector." In the absence of political beasts like Donald Trump, some commentators have argued that newly-elected populist President of Brazil Jair Bolsonaro has stolen the spotlight at Davos. His speech on Tuesday during day one of the WEF, however, drew the ire of environmental and climate change NGOs and activists who called on him to alter his economic policies in order to safeguard the Amazonian rainforests from corporate interests. • Former British Prime Minister Tony Blair called Brexit “a complete mess” and branded Theresa May’s threat of a "no deal" Brexit “not responsible.” In an interview with Bloomberg at Davos, he said: “I don’t think there is a majority right now in the British parliament for any proposition.” He renewed calls to hold a second EU referendum to break the parliamentary deadlock. • A war of words between Italy and France threatened to melt the snow a little in Davos after a French economy minister told Euronews’ Sasha Vakulina that Italy should not interfere in its neighbour’s internal affairs. It came after Italian Deputy Prime Minister Luigi di Maio accused France of profiting from Africa because of its colonial past, while Matteo Salvini, the Italian interior minister, urged French people not to vote for Emmanuel Macron in the upcoming European elections. • Microsoft CEO Satya Nadella said he hoped that the United States would put in place similar GDPR regulations as the EU to protect US citizens’ privacy. “My own point of view is that it’s a fantastic start in treating privacy as a human right,” he told a discussion panel, arguing that Americans deserved the same data protection rights as their European counterparts.